In 2017, 154,225 enterprises in Canada imported goods from abroad, up 5,339 from 2016. The growth was widespread among every sector of the economy. Small and medium importing enterprises (SMEs) accounted for 98.6% of all importers in the country in 2017. These firms were responsible for 47.3% of total Canadian imports by value. From 2010 to 2017, imports by SMEs grew by 43.6% compared with 34.1% for large enterprises. Canadian enterprises diversified their markets for imports from 2010 to 2017, with 59.4% of all Canadian importers purchasing goods from both US and other foreign countries in 2017, up from 56.6% in 2010. Geographical diversification of imports also differs depending on the size of the importing enterprise. In 2017, 89.9% of all large enterprises imported goods from both US and non-US markets, compared with 58.9% of all SMEs. More Canadian firms were drawing their imports from Asian and European markets in 2017 than they did in 2010. On a country basis, specifically the last country from which the good is exported before entering the Canadian economy (referred to as the country of export basis), there were 10,402 more enterprises importing from Asia in 2017 than in 2010, and 5,472 more enterprises importing from Europe. Meanwhile, the number of enterprises importing from North America was down by 9,646 in 2017 compared with 2010. Despite the changes, North America remained the most important market for Canadian importers in 2017, accounting for 67.4% of all imports in terms of value. This share was up from 65.0% in 2010, reflecting the higher-value products imported from this region, such as vehicles, parts and petroleum products. Imports can be broken down based on the nature of the two parties involved in the transaction. If one party holds 5% or more of the voting shares of the firm it is dealing with, the import transaction is deemed to take place between two related parties. Each year since 2010, over 40% of all Canadian imports have been conducted between related parties. In 2017, imports from related parties reached a record high $234.3 billion, accounting for 44.5% of total imports. Among all sectors, wholesale was the lone sector which imported more from related parties than from unrelated parties. On a country of export basis, 46.7% of all imports from the United States were between related parties. 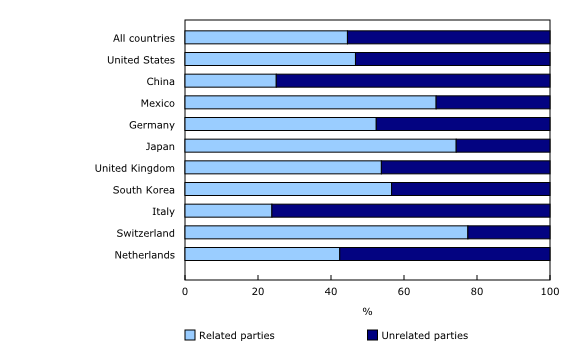 Switzerland (77.5%), Japan (74.3%) and Mexico (68.8%) had the highest shares of imports between related parties. Conversely, Italy, China and the Netherlands had the lowest shares. On a commodity basis, imports from related parties in Switzerland were led by pharmaceutical products and supplies. For Japan, the main products imported from related parties were motor vehicles and parts, while for Mexico, vehicles and tractors dominated. Ontario firms continued to lead the importing activity in the country in 2017. In Ontario, 62,651 establishments imported $335.6 billion worth of goods, accounting for 39.7% of all importers, and 63.8% of all imports in Canada. The wholesale sector accounted for 52.9% of Ontario's total import values, followed by the manufacturing sector (32.2%). In Quebec, 28,885 importers purchased $82.4 billion worth of goods from abroad in 2017. Manufacturing was the largest sector, with the transportation equipment subsector accounting for 36.5% of the manufacturing sector imports. British Columbia saw the largest increase in the number of importers from 2010 to 2017. The province added 1,085 importers over this time, mainly reflecting more firms purchasing goods manufactured in Asia and Europe. The Trade by Importer Characteristics: Goods program is an initiative at Statistics Canada undertaken to analyze the business characteristics of importers of goods in Canada. These estimates are formed by linking customs merchandise trade data records to business entities in Statistics Canada's Centralized Business Register. Customs import data are collected jointly by Statistics Canada and the Canada Border Services Agency. The Business Register contains the complete operating and legal structure of enterprises operating in Canada, as well as their key characteristics such as employment and economic activity based on the North American Industry Classification System. This release contains information at both the enterprise and establishment levels. An enterprise is defined as the statistical unit that directs and controls the allocation of resources relating to its domestic operations, and for which consolidated financial statements are maintained. An establishment is the smallest statistical unit within an enterprise structure, and better reflects the primary industrial activity and the province of the importer. The two measures generate a different number of importing units, as well as a different industry allocation of these units. Country of origin is the country of production or the country in which the final stage of production or manufacture occurs. Country of export is the country from which the goods were exported or sold to Canada. The country of export is different from the country or place of transshipment. Many goods which are shipped to Canada may stop at some place along their route to either change carriers, or to be consolidated or deconsolidated to make shipping easier. This type of stoppage is considered a transshipment point, but it will not change the country of export. Domestic re-imports are goods of Canadian origin, whether grown, extracted, or manufactured in Canada, that are exported to another country and then returned to Canada in 'the same state' as they were sent out. A related party is defined as a party that holds or controls 5% or more of the outstanding voting stock or shares of the other party it is transacting with. In this release, data disseminated at the provincial level is conceptually different from customs-based merchandise import data. 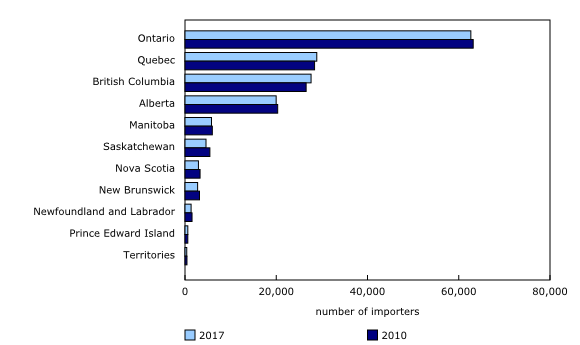 Provincial data for the Trade by importer characteristics: Goods program are based on the province where the importer is located, and goods can be shipped to other provinces for final consumption. Customs-based merchandise imports are based on the province of clearance; this is the province where the goods are cleared at customs, but this may not always be the province in which the importer is located. Detailed information on concepts and methodology relating to this release is available on theTrade by Importer Characteristics: Goods survey page. In this release, the total value of imports refers to the part of the annual import value (customs basis) that can be linked to specific entities in the Business Register each year. Annual import values (customs basis) can be obtained from CANSIM table 228-0060. Additional information and definitions related to merchandise imports are available on the survey page for Canadian International Merchandise Trade (Customs Basis). Each year from 2010 to 2017, the total number of identified importing enterprises accounted for 93% to 96% of the total import value. Throughout this release, the percentage share of import value corresponds to the share of the annual import value for which there was an identified importer. 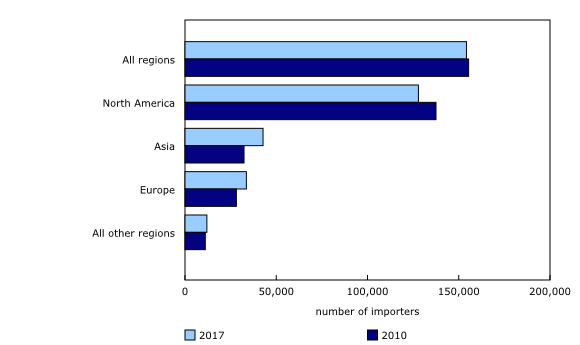 The number of importers corresponds to the number of importers identified within the Business Register by the Trade by Importer Characteristics program. To enquire about the concepts, methods or data quality of this release, contact Angela Yuan-Wu (613-240-2871; angela.yuanwu@canada.ca) or Ying Di (613-867-2736; ying.di@canada.ca), International Accounts and Trade Division.